I was curious about my body fat percentage and decided to take action. 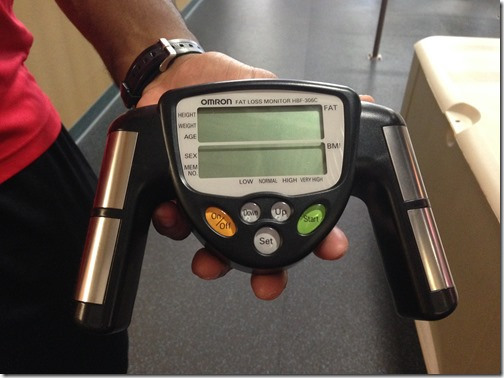 I spoke with a trainer at the Elk Grove California Family Fitness acquiring to have my body fat percentage taken. When we met I gave him my stats: height, weight, current health issues and more. The trainer said that he would be able to administer three different type of tests to measure my body fat. They each had a margin of error, but it would be a good baseline to recognize where I currently am with my health and fitness goals. Handheld device. 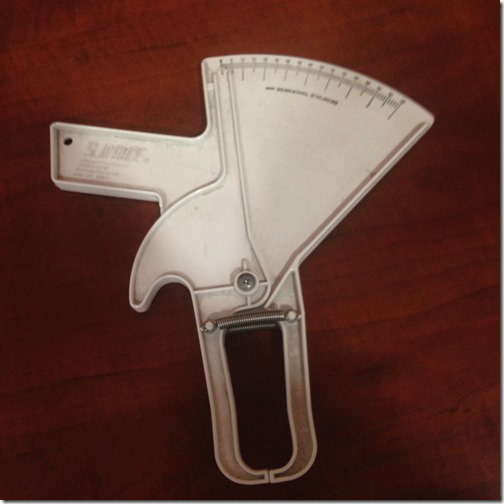 This was by far the simplest way I had my body fat percentage measured. I simply gave the trainer my height, weight and age. He pressed a button and I held on to the handheld with my arms extended. My trainer told me that the results yielded a 3-5% margin of error. Calipers hurt. Kidding. Well, it does pinch. My trainer and I met in his office of some sort of privacy. There he measured 7 points to pinch my skin/fat to measure my body fat percentage with this technique. My trainer told me that this yielded a 1-3% margin of error. The more points of origin you measure the lower error rate. Coincidentally enough this method gave me the highest percentage of body fat. 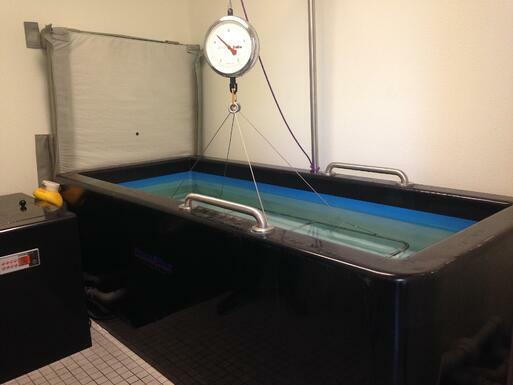 Hydrostatic Body Fat Testing. This method is claimed to have a 1% margin of error. It is supposed to be the most accurate for recording body fat percentage. I was super jazzed to find out that the Elk Grove location has this underwater weighing scale available to use for a small fee of $50. My results to the three different methods were pretty close in number to each other. It didn’t tell me anything new regarding my body fat percentage. I know that I need to focus more on portion control and really, really need to add in strength training. In order for me (or you if you are wanting to have a similar goal) to lower body fat percentage, it would be wise to pay close attention to your nutrition, make movement a priority during your day (sweat!) and add strength training to your daily routine. If you are serious about improving your health and fitness, lowering your body fat percentage, and gaining strength… I encourage you to find a personal trainer and ask him/her to do one (or more) of these tests. It is a great way for you to figure out your starting point… so you can make a plan with where you want to go with your health and fitness goals.